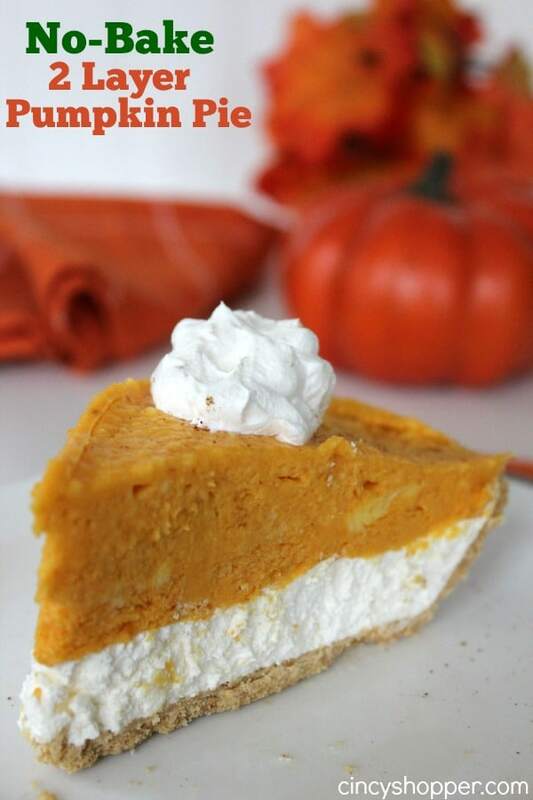 If you are needing an easy fall or holiday pie this No Bake 2 Layer Pumpkin Pie Recipe will be great. We love making no bake pies when serving a crowd during the holidays. Anything that we can make ahead of time always makes the food prep on holidays so much more simple. I have a few pumpkin fans in my house and family so having many pumpkin desserts is a must. 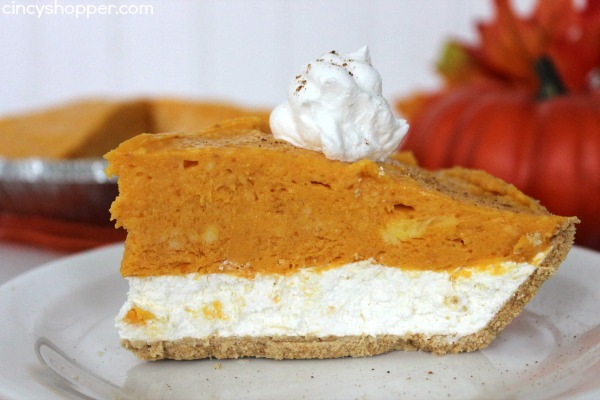 This No Bake 2 Layer Pumpkin Pie recipe is loaded up with great pumpkin flavor. YUM! 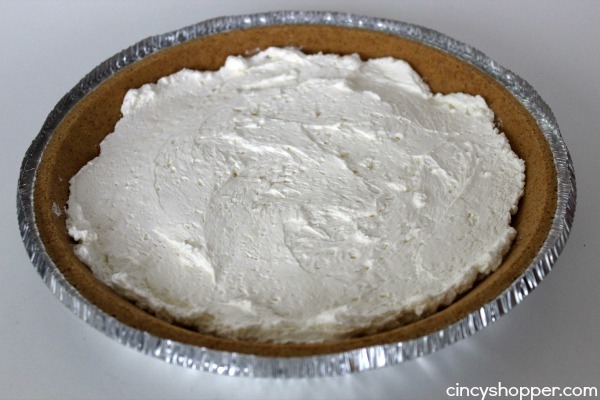 We plan to serve this pie and also our Easy Peanut Butter Pie over the holiday season. I know our Pie table will be loaded up with lots of delish pies. My daughter and I enjoyed this pie yesterday afternoon after our light lunch. We both LOVED it. Perfect paired up with our hot cup of coffee. It was a perfect fall afternoon (pumpkin and coffee always make the day better). 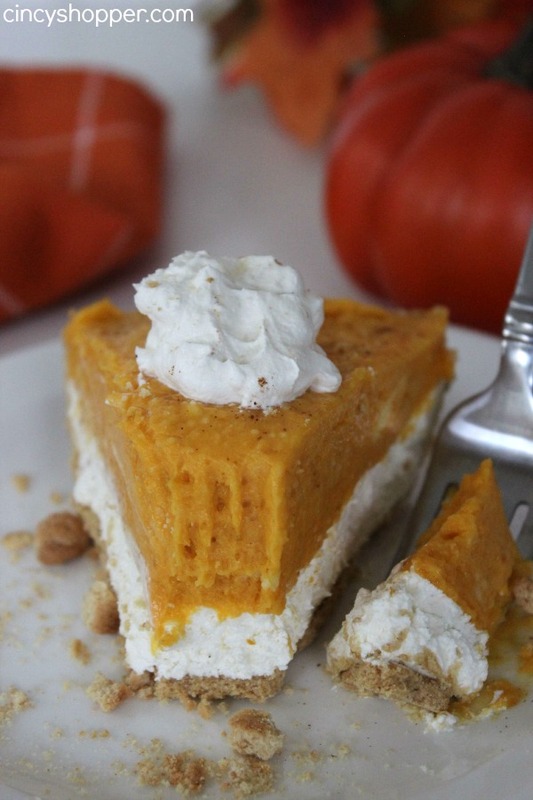 Your ingredients and prep for this No bake Pumpkin Pie are very simple. Just grab your crust and mix up a few ingredients. Then toss in the fridge to chill for a few hours and you will have a perfect pie in no tome at all. 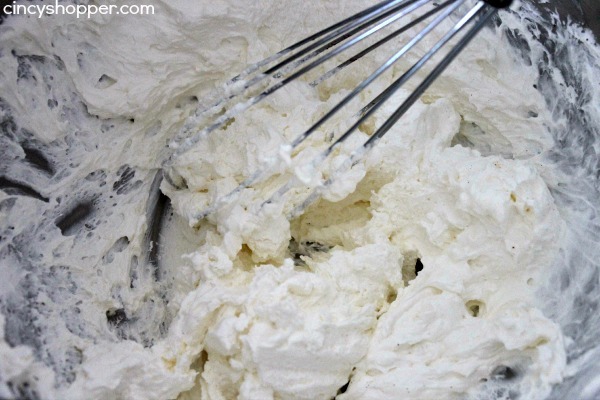 Blend together cream cheese, 1 tablespoon heavy cream and sugar until smooth. Spread mixture on pie crust. 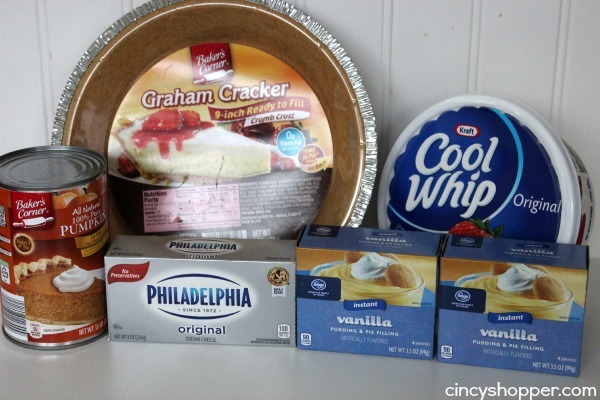 Whisk together 1 cup heavy cream and pudding mixes. Add in pumpkin and pumpkin pie spice and whisk until blended. Top with Cool Whip, if desired. Place in refigerator for several hours until set. Perfect for Thanksgiving. I love how easy it is too! Thank so much for linking up to Wonderful Wednesday Blog Hop. 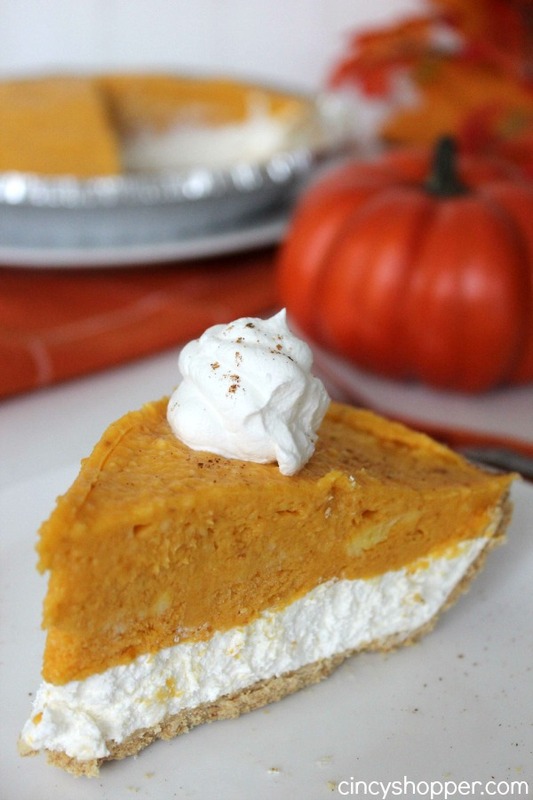 Your pumpkin pie looks amazing! I am sharing it tonight on my Facebook and Google+ page. This looks so good. Pinned it! Have you shared this yet at my Wonderful Wednesday Blog Hop? Please do! My readers will love it. This looks great! I love pumpkin pie, but my husband doesn’t like the texture. I will have to see what he thinks of this. 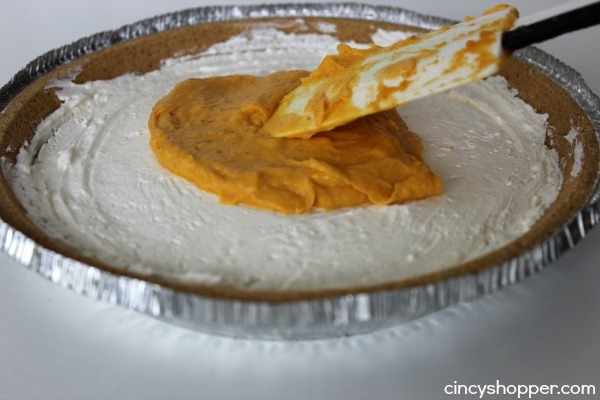 Delicious no bake pumpkin pie, love to try it for this thanksgiving. thanks for sharing with Hearth and Soul blog hop. pinning. This Pie looks fabulous! Hope you are having a great day and thank you so much for sharing this awesome post with Full Plate Thursday. You pumpkin pie looks so YUMMY-Jen! I’m definitely pinning and sharing!! This looks so yummy!! And I love that it’s a no bake dessert! I would love for you to stop by and Join my Link Party – My 2 Favorite Things on Thursday!! It’s going on now until Monday. I would love to have you and I pin everything! Have a great week!! This is so great. I would love you to stop by Food on Friday: Essentially Raw Treats over at Carole’s Chatter to add this to the recipe collection! Cheers! I’ve made this pie — 23 years ago in Idaho. Truly! Been looking for this recipe again ever since. I have to warn you — it is ADDICTING! It’s deadly to dieters everywhere! If you don’t want to be as round as you are tall, don’t make this pie. On the other hand, if you’re only going to make it once (or twice) a year, then have at it! But therein lies the problem… CAN you make it just once or twice a year?? Only one way to find out, but you have been warned. It’s truly the yummiest, if you’re looking for a really good variation on the traditional pumpkin pie.